Today is the 25th anniversary of the death of Sen. Benigno “Ninoy” Aquino, Jr. and I guess it’s only fitting to feature the place where this eminent statesman was assassinated and that is the tarmac of NAIA Terminal 1. I was only a day over three years old when Ninoy Aquino was gunned down shortly after de-boarding his plane at the Manila International Airport coming from a three-year exile in the United States during Ferdinand Marcos’ administration. (See this iconic TV screenshot of Ninoy lying down on the tarmac.) The passage of Republic Act No. 6639 on August 17, 1987, during the administration of Cory Aquino —Ninoy’s wife—gave the airport its present name: Ninoy Aquino International Airport or NAIA. Aquino’s assassination ultimately started the chain of events that led to the downfall of Marcos’ regime and the return of democracy to the Philippines. Two independent commissions were started by Marcos to investigate the assassination and the second one, the Agrava Fact-finding Board, concluded that the military men that accompanied Aquino at the airport as well as Marcos’ right hand man Gen. Fabian Ver were behind the murder, though they were acquitted in 1985. Later, a trial opened in 1986 during Cory Aquino’s administration and found rank-and-file military men guilty in 1991 and were sentenced to reclusion perpetua. These men (some have died) are still at the New Bilibid Prison serving their sentence though there have been moves to give them presidential pardon in the past few years. Despite the closure of sorts, the mastermind behind the killing is still unidentified. 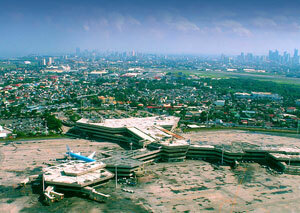 As for NAIA Terminal 1, the building was quite state-of-the-art when it was constructed way back in 1981. Due to its age and decrepit state, two more terminals were constructed: the previously featured Centennial Terminal in 1998 (opened in 1999) and the controversy-ridden Terminal 3, which finally started operations late last month. If you’re interested, there’s tons of information over at the airport’s Wikipedia article. When I landed at NAIA Domestic a few weeks ago, I wondered where is the exact spot where Ninoy fell. Any idea? Migs, believe me I would’ve pointed it out if I knew. There’s supposedly a marble slab with Ninoy’s silhouette on the exact spot. I was at the terminal 1 last night sending off a friend and we notice the OFW lounge is so ugly. dilapidated, totally in disarray! What are doing with the money being paid by our kawawang mga OFW as terminal fees? Taxes? At kung ano ano pa sinisingil nyo sa mga tarvelers natin? The lounge alone is only a provincial bus terminal in other countries! Why cant you give your services back to the people who pays honestly? Only for you to satisfy first all your hungry pockets? Maawa naman kyo tama na kasakiman nyo and all those corruption. Be a role model sir! since you sit there as the manager walang nangyaring improvements dyan! Sana naman tamaan kyo nitong mail ko! wake up na kyo sir! Balik nyo na sa tao yan! I hope this will serve as a wake up call for you! Pag di pa kyo tinablahan, MAKAPAL NA TALAGA KYO SIR! I’ll just want to make a complaints against the lady who collecting fees for boarding pass.She is quite arrogant and mataray to other passenger. Instead of being nice to customer sya pa etong ngtataray na kala mo sya mayari netong NAAIA 1. I have a person ahead of me which is i know n baguhan lang din n mgaabroad.Instead of saying to a person na sir pwedeng pkisulat ng maayos etong name nyo.She said d nyo ba nababasa yan! As if n npapahiya ka sa ibang taong nkapila dun. In my case nman i feel humilliate also because she is shouting like na manenerbyos ka sa knya.Why not say it slowly and nicely.In that time tumahimik nlng ako but next time n umuwi ako sa pinas i will make a complaint against this lady na di namn kagandahan kundi bako bako ang mukha.Hope maturuan eto ng leksyon ng di n mkaranas ng nerbyos ang ibang customer. I was on my Departure flight,had a dinner at the naia 1 the food was disgusting. I feel sad for the country how us Filipino dont have the sense of how to be comfy.Then went to paid my exit travel taxes and checked in counter everything goes well, until at the immigration booth .the officer ask me where is my destination/asked me what i will do there? I told him im going for Holiday after he open my passport and said but you been many times there.told me go for checklist to go in office and have paper to fill up,he was so arrogant officer. WHAT THE HECK? I am a legal citizen and can afford to pay my travel and expenses,i dont see any problem with that.I told him if i miss my flight then i will sue him. There is not such law in Philippines that Filipinos are limited to travel abroad. Its pity that still our country is not competetive like the rest of southeast asia because of this crab mentality and corruptions. There is no hope for this country it FILIPINOS WHO WILL KILLED ITS OWN COUNTRY…..